It’s good to be home. 6 weeks is a long time to be away. Between vacation and General Council, it’s been a busy summer. I won’t go into great detail about what I did all summer long this morning, but it was a good summer. We rested. We saw friends. We traveled. We laughed. Aside from some small moments which weren’t the best, it was a good summer. A little hot maybe, but a good summer. One story I will share is from the time Bev and I spent in the Niagara region. We had the opportunity to go mainly because if I preached in a church in Niagara Falls, we would have free house for a week! Seemed like a pretty sweet deal. So we took it. You thought it was hot hear in Cape Breton this summer? You should have been in Ontario. We went to the church, and it was a lovely service. Hot, but very nice. There is no air conditioning, no fans… just hot. We went outside after church, and it was cooler than in the church. And it was 35C outside! So to cool down, we thought we’d go to a local outlet mall. The only problem was, it wasn’t a mall. It was laid out like a mall. It had stores all lined up just like a mall, but you had to go outside. So basically it was a mall without the covered hallways. After shopping we went back to the house… that’s when it hit me. Heat exhaustion. I was sick. Thankfully the house was air conditioned as I tried to cool myself down. But it did take me a good day and a half to recover. After that we were much more aware and careful in the heat, even when we came back to the heat of the Maritimes. I think we were able to ward off other instances of heat exhaustion for others, at least we were able to keep the symptoms to a minimum. I hope you were able to take good care of yourself this summer in all of the heat! As much as we like to live carefree at times in the summer, we still need to watch ourselves. We can still get sick or hurt. We need to be aware of our bodies and how we are taking care of ourselves. I confess that I count myself lucky this morning. Mainly that I can still fit in this suit after all the food I ate this while I was away! I haven’t stepped on a scale yet, mostly because I’m afraid to. This morning in the Gospel of John, Jesus is asking us to be aware. He’s asking us to be aware of the things which have an impact on how we live. Jesus has come to the earth in order to invite us into a relationship with God. A relationship that will not only impact our lives here on earth, but for all eternity. In order to fully enjoy and embrace this relationship with God, we need to be aware of the things around us, the things we have in our lives, which either enhance or inhibit such a relationship. Paul also asks us to consider the same influences in the reading from Ephesians. Both readings talk about what we bring into our bodies. But what we bring into our bodies is more than just what we eat or drink. There’s also what we watch. There’s what we read. There’s who we hang around with. All of these things influence us internally, they help wire our brain in a certain way which impacts how we act. When people drink to excess, do good things generally happen? Do people make good decisions? Not that I’ve seen. Some people may like a glass of wine once in a while, or maybe a beer. Sure, for some people that may be fine once in a while. It’s not my thing, but for some people it seems to work. But when there’s too much, that’s when bad things happen. People get hurt, relationships are broken. And he’s right! Receiving the Holy Spirit is a feeling like none other. It fills your heart and your head in all the right ways, and it’s a feeling you will want to hold onto for the rest of your life. What’s even better? I guarantee you will not regret it the next morning! No hangovers here. When we look at what Jesus is sharing with us from the Gospel of John this morning, we see a he’s setting us up for two things. One is the Eucharist, communion. Later on Jesus will sit with his disciples at the Last Supper and share with his friends that he is the bread and wine of salvation. Which leads to the second thing he’s setting us up for, and that is his sacrifice on the cross, where his broken body and spilled blood will bring us new life with God through the forgiveness of our sins. The invitation of Jesus is to rely on him for life. Yes we need bread and water to live. But is that all? Jesus is offering us something far greater. He is offering us new life, new meaning, and hope. When Jesus talks about the bread the father’s ate, he’s referring to Moses and the Israelites in wandering in the desert. Remember they were hungry and God made manna for them, bread which came from heaven every morning. But even though they ate this gift from God, they still died. 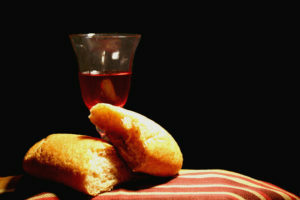 The bread Jesus offers is the bread of life. It’s not something we eat, it is the receiving of the knowledge that Jesus Christ is our Lord and Saviour, and through him we have a relationship with our God, our Father in heaven. This bread from Jesus changes who we are, it gives us hope and life, it takes away our desire to sin because we want to know Jesus more, and we will hunger and thirst for this knowledge. And as we gain this knowledge, we grow in relationship with him who gives life, and we will be full and satisfied. I mentioned one of the other things I did this summer was attend the national meeting of the United Church of Canada, we call General Council. It’s a week long meeting of people selected to attend, and I was selected by Sydney Presbytery to go. At the meeting we voted in favour of major restructuring changes for the church. How we are going to function as a denomination is about to change dramatically. For some people this has caused a lot of stress and anxiety as changes are coming soon. On January 1, just over 4 months away, things are going to change. Personally, I am not overly stressed about it. Why? Because on January 1, this church will still exist. We will still worship on every Sunday morning. We will still provide ministry in this building. We will still be a church. Whether the changes cause the United Church to flourish or come crashing down around us, Carman will still be here. The reason we will still exist is because we find our identity not in the United Church of Canada… we find our identity in Jesus Christ. He is the reason why we are here. He is the reason why we worship. And for that reason, we seek to follow him each and every day of our lives. To be inspired by him, to be led by him and to help others meet him and know them in their own lives. When we look at the children we just had the honour of baptizing this morning, this is part of our call as a church. We, as a church, promised these families this morning that we will pray for them and we will walk with them in their own journeys of faith as they raise their children. This is probably the most beautiful thing we can do, promise to help raise children to know Jesus as we ourselves seek to know him. Are we perfect? No, but we won’t be either, but we can strive to follow Jesus as best we can and remember he is the bread of our life, he is the one who sustains us and feeds us. He is the one who gives us life, and through him, we are ready. Jesus is ready, and he’s offering us a gift we should never take for granted, a gift which will change not just ourselves, but the world around us. May we take all he has to offer and let it fill us and renew us as children of our great Father in heaven. You are our bread of life. Without you we stand to wither and fall to the temptations of the world. Yet with you, we stand tall and strong as we receive the new life you promise. So we ask you, Lord Jesus, to continue to feed us, to fill our souls with hope and love and peace. Help us to overcome the challenges we face each day, and lead us in the way of everlasting. We ask all these things in your strong and powerful name. Amen and amen.